All Giannini Cast-Stone Items are proudly made in USA. Giannini Garden Ornaments was founded in 1993 by Marino and Piera Giannini. Their first designs were hanging wall fountains and planters. Giannini now occupies a 2.5 acre factory and showroom in South San Francisco, California. We cast up to 900 cast-stone fountains and statue molds a day that form fountains, planters, pedestals, benches and statues that the Giannini’s design and all are produced on site. Marino and Piera are now joined by their sons, Pier Luigi and Alessandro who help run the stone cast factory and showroom right here in the San Francisco, Bay Area. As a truly hands-on business it takes two to three months to take one of Marino’s drawings from start to finish and involves a skilled process of hand sculpting and mold making. 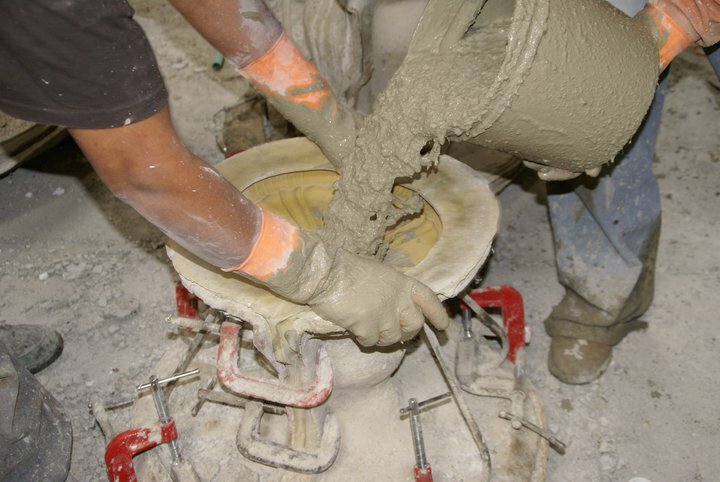 When the mold is ready for production, it is filled with a slurry of high quality cement, aggregates, water, steel, synthetic fibers, and additives to ensure strength and durability. The product is then cured and finished with one of their 20 signature colors that are applied by hand. Take a look at their production page to view the whole process. Giannini Garden’s South San Francisco Showroom is Open to the Public. Giannini Garden’s vast selection of cast-stone garden ornaments supplemented by their imported pizza oven, water spouts and Italian ceramics, can complement your garden area in ways never dreamed of. Marino And Piera travel to Italy several times a year for their buying trips. They have personally selected every item that is imported back to their showroom. Wood burning pizza ovens, high quality terracotta, planters, imprunetta planters, hand-carved stone fountains, beautiful and colorful ceramics, and patio furniture that is all made in Italy. If you visit the showroom and factory, Giannini’s staff is helpful and knowledgeable. A family member is always on site to give expert advice. Giannini has their own delivery trucks and set-up crew to ensure excellent service. Giannini Garden Ornaments has the biggest selection of fountains and statuary in the country that is proudly made in the USA.